This report discusses applying Lean to an HR service delivery model. Many LDCs operate with a traditional utility mindset, and often have culture and investments steeped in the legacy of a 100+ year old company, making it difficult to address challenges of attrition, volatile commodity prices, uncertain demand, shrinking margins, and continued competition from electric. Several leading LDCs have used a proven Business Process Improvement (BPI) method to review and improve their core business. In doing so, they have improved operating income per employee, ingrained a culture of continuous improvement, and created real, positive change in how employees do their jobs. Natural gas local distribution companies (LDCs) continue to be faced with attrition, or at best slow growth, volatile commodity prices and uncertain demand, shrinking margins, and continued competition from electric. Addressing these issues can be challenging, particularly for companies with a traditional utility mindset and culture and investments often steeped in the legacy of a 100+ year old company. Taking a fresh look at what you do, and how you do it, is good for shareholders, customers, and employees. Companies tackling these issues from the process/function level, how the work actually gets done, have seen immediate and sustained results in three areas—financial performance, customer service, and culture. Shareholders benefit from improved operating efficiencies and a more competitive cost structure; customers benefit from improved customer service and lower (or more slowly increasing) rates; and employees benefit from additional opportunities and improved tools and by becoming more engaged in a new culture where continuous improvement is the objective and it is okay to try new things and change. One of our clients, a leading LDC, continues to recognize the BPI process in investor communication for contributing to its increasing operating income per employee. 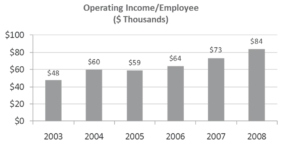 This LDC improved from $48K operating income/employee in the year prior to the process (kicked off January 9, 2004) to $84K operating income/employee in a recent year. The fact that this figure continues to increase is a testament to the environment of continuous improvement that has been ingrained in the Company. 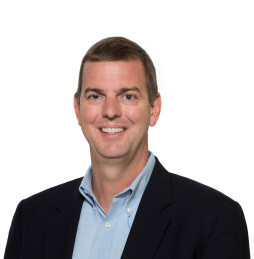 ScottMadden’s support includes providing the methodology, supporting project management, facilitating and performing analysis, offering best practices, supporting communications and change management, and helping to develop deliverables. For more than 25 years, clients have trusted ScottMadden to provide guidance as they face the challenges associated with growing, consolidating, acquiring, or just aspiring to do what they do better. They trust our people, methods, and solutions; and they trust us to see them through, start to finish. Meet with us, and let us put more than 25 years of trusted business consulting to work for you. For more information, contact Ed Baker (edbaker@scottmadden.com) or go to www.scottmadden.com.